Coaches play a very crucial role in sports excellence and helping our athletes to realise their sporting potentials. These individuals motivate, encourage and inspire our athletes and if without them, most athletes would fail to reach their full potential. Coaching is therefore central to the development of sport at every level. A coach is also the athlete’s friend, mentor, competitor and sometimes, a pillar of strength as the athlete pushes himself to the limit and excels on the world sporting stage. Advisor – Advising athletes on the training to be conducted and suitable kit and equipment. Chauffeur – Transporting them to sporting events if parents or family are unavailable to take them. Counsellor – Resolving emotional problems on the basis that sharing anxieties can be both relieving and reassuring. Demonstrator – Demonstrate to the athletes the skill you require them to perform. To achieve this it is important that you also keep fit. Friend – Over the years of working with an athlete a personal relationship is built up where as well as providing coaching advice you also become someone, a friend, who they can discuss their problems or share their success with. It is important to keep personal information confidential because if you do not then all respect the athlete had for you as a friend and coach will be lost. Facilitator – Identify suitable competitions for them to compete in to help them achieve their overall objectives for the year. Fact finder – Gathering data of national and international results and to keep abreast of current training techniques. Fountain of knowledge – This may be part of the advisor role in that you will often be asked questions on any sporting event, events that were on the television, diet, sports injuries and topics unrelated to their sport. Instructor – Instructing athletes in the skills of their sport. Mentor – When athletes attend training sessions you are responsible, to their parents and family, for ensuring that they are safe and secure. You have to monitor their health and safety whilst training and support them should they have any problems or sustain any injuries. Motivator – Maintain the motivation of all the athletes the whole year round. Organiser and planner – Preparation of training plans for each athlete and organise attendance at meetings and coaching clinics. Supporter – Competition can be very nerve racking experience for some athletes and often they like you to be around to help support them through the pressures. Role of a ‘Friend’ and perhaps ‘Counsellor’ come in here to. To assist SDSC volunteers/coaches/officials to upgrade, enhance and improve their technical and professional coaching capabilities with the eventual outcome of supporting our athletes and the sports. Beside the above coaching roles, coaches of varying technical and professional capabilities are needed for different level of sports development. For instance, an elite coach must be able to plan a suitable competition schedule for elite para athletes so that they are able to peak at the right moment in important competitions and to allow adequate rest periods in-between competitions and trainings. A junior coach may therefore place more emphasis on the basics of that sport and to build up a good foundation from which the athlete can move onto a higher level or into the next developmental phase of his /her training. There are four different levels for any individual / coach who meet the respective minimum coaching criteria to come into SDSC’s coaching framework. Once they are accepted into the Coaching Framework, they are expected to sign a Coach Agreement:/Contract that would spell out the terms and conditions of their employment, their Targets or Key Performance Indicators and their role and responsibilities as coaches. All coaches must sign a coach agreement/contract prior to the commencement of any sports training. 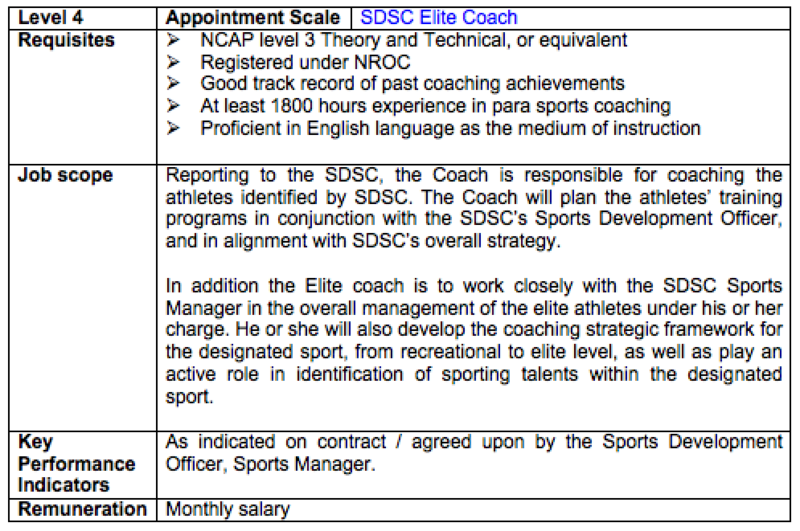 This will spell out clearly what is required of the coach from the different scales and what is expected of him as an SDSC coach. Target setting is compulsory as it would determine how well the coach performs in his role and is he meeting the desired outcomes. A coach review will be conducted nearer the end of the date to ascertain the coach’s performances in relation to the stated KPIs. Coaches are also required to submit their athletes’ monthly attendance report. This would be a generic template that all coaches must complete and submit to the respective SDO at the end of every month. Coaches are also expected fill in a Progress Report to monitor the athletes’ performance on a monthly basis. This Progress Report must be submitted as and when requested for by SDSC. The Coach Development Grant (CDG) provides financial assistance to individual sports coaches who wish to upgrade their coaching knowledge and skills via attending coaching attachments, conferences, short-term courses, workshops and seminars as well as obtaining a Degree or Diploma, both locally and overseas. All learning activities covered by this grant will be known as ‘CDG Activity’ in subsequent sections. SportSG will review the application and deliberate on the actual grant amount for each application. Please note that SportSG reserves the final right on the funding decision.